What is the difference between wool, down padding and synthetic materials? Down padding and synthetic materials are first and foremost insulation materials that keep the body warm and don't let the heat out. During the night, these insulation materials increase our body temperature, which causes us to wake up or turn over to look for a cooler spot. Have you ever woken up at night with that sweaty feeling ? Wool is not only insulating, as it also acts as a regulator for body temperature. Wool naturally absorbs and lets out humidity, to either cool down or warm up your body. You will quickly feel warm, but thanks to this material's exceptional breathability, you won't sweat. Can I wash my Zizzz Swisswool woolen duvet ? Yes, you can wash your Zizzz Swisswool woolen duvet in the washing machine, no problem. Just don't forget to use the special wool program and a special laundry detergent for wool. The only thing to avoid is the tumbler. Wool is too delicate for it. What are the advantages of the Zizzz Swisswool woolen duvet? Our Swisswool padded duvets are light and airy. They offer a very comfortable sleep environment all year round. You can easily wash them with a 30° wool program. Wool's unique body temperature regulating features will ensure that you wake up fresh and rested every morning. Wool is naturally hypoallergenic, it's a very breathable fiber that does not attract dirt. Feathers and duvet padding tend to attract dust, dirt, as well as mites. Mites don't like wool, as it is highly breathable. Wool in the duvet remains drier than other types of padding. The less humid the environment, the less hospitable it is to mites. Does the Swisswool woolen duvet itch? No, Swisswool wool does not itch. Whatsmore, our Swisswool wool is covered with a layer of very fine fairtrade batiste cotton. It is very soft to the touch. Wool allows for the evacuation of humidity. 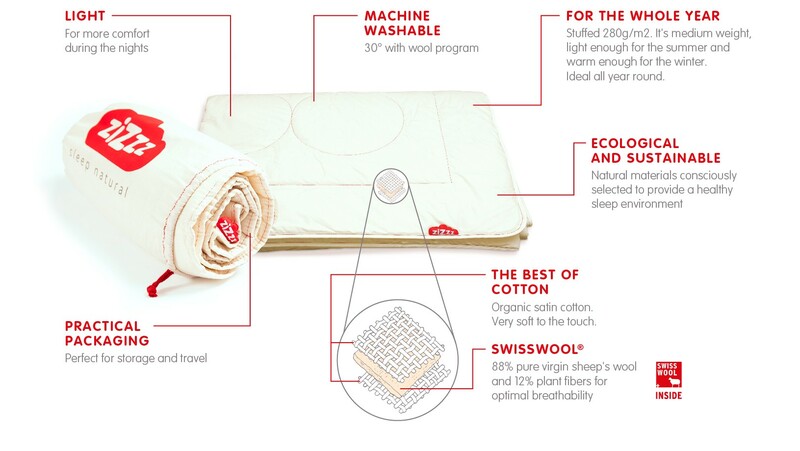 This feature, along with its breathability, really makes Swisswool wool the ideal padding for sleeping bags and duvets. Swisswool wool, used amongst others by Ortovox for ski clothes, is very efficient in helping regulate body temperature, and it's washable. This guarantees your sleeping comfort. Try it out and you'll be convinced ! Swisswool is an ecological material made of pure virgin sheep's wool (88 %), from sheep raised in the Swiss mountains. It's reinforced with plant fibers. Swisswool is a local and sustainable product. Farmers bring their raw wool to collection points all over Switzerland. The fleece is then sorted according to quality. Only the very best quality is used in Zizzz Swisswool woolen products.